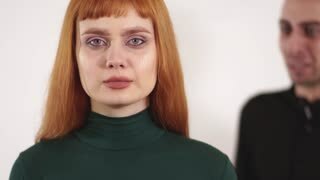 Young upset beautiful woman with red long hair is crying and young angry man is yelling behind her back. Portrait of upset crying young beautiful female with long red hair. Aggressive angry man yelling at crying young woman with red long hair and tie females hands with belt showing his violation. Angry upset young woman with red long hair yell at the quiet man with taped mouth. Then male remove red tape from his face and scream. Upset woman yelling at young man, shaking waving hands and guy grabbed her arms and try to stop girl with long red hair and make her calm down. Aggressive drank man with bouttle of alcohol drinking from a bottle and upset young woman with long red hair yelling and crying. Angry agressive man yelling at his beautiful girlfriend with long red hair. Woman close her face and ears, she can not listen this bad words.